Hyderabad Metropolitan Water Supply and Sewerage act for the Supply of potable water including planning, design, construction, maintenance, operation & management of water supply system. Hyderabad Metropolitan Water Supply and Sewerage have more online services for Apply New Water Supply Connection/Pay & Download Water Bill/HMWSSB Book Tanker & Get Status/Check Grievances Status/Search Your Account No.etc. ** Customer has to apply for New/Enhancement/Feasibility receipt of water or sewerage connection by logging into HMWSSB website hyderabadwater.gov.in by filling online application form. ** No physical application form will be accepted. Go to the official website click on the Service tab in main menu, then click on the Apply New Water Supply Connection option in drop down menu list. 6. Click Submit Application button. ** Alternatively Customer can apply for New/Enhancement of water or sewerage connection from the Kiosk made available at all the HMWSSB cash counters Download here List of Cash counters with address enclosed. ** After entering details such as name, address, locality, area, contact number etc., a copy the application form will be generated and can be downloaded for printing from website consisting of customer details along with a unique File Number. Customer has to refer this File number for all purposes. ** An SMS will be sent to consumer requesting to pay processing fee against the file number. ** Customers can make payment of processing fee at any of the HMWSSB cash counters (List of Cash counters with address enclosed) in CASH/ DD (or) Online from HMWSSB website hyderabadwater.gov.in referring the File Number. ** On receipt of the processing fee an acknowledgement SMS will be sent to the Customer containing the details of the Section Manager to whom his application is orwarded for Feasibility with contact number of section Manager. ** Customer can view the status of application at HMWSSB website hyderabadwater.gov.in at any point of time. ** Once feasibility is verified by the GM(O&M) concerned, a downloadable intimation sanction letter will be generated requesting the customer to submit necessary documents at the O&M Division office to process the file. ** A copy of intimation letter to customer will be dispatched through post by the concerned GM (O&M). ** An SMS will be sent to the Customer with information that the connection is provisionally approved and with a request to submit necessary documents for final approval at GM (O&M) Office. ** Once necessary Documents are verified the GM (O&M) gives final approval for the feasibility and generates intimation letter for payment of connection charges and communicates the same to customer by post. The days of long queues and interminable waits are now over! The HMWSSB offers its customers numerous bill payment options. 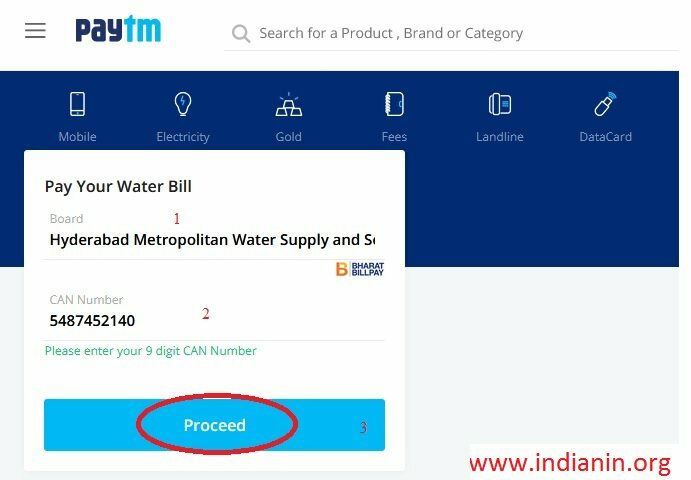 Go to the above link,click on Pay water bill online option button scrolling on home page. Choose Which of the following works best for you and pay your bills at ease and at your own pace. 1. Please enter CAN No. 2. Click on submit button. ** All the HMWSSB consumers can make water bill payments though NEFT/ RTGS channel by giving NEFT/RTGS request in favour of HMWSSB at their respective bank with the NEFT/RTGS account details printed on the water bill issued by HMWSSB. ** A customer shall use the account details printed on their bill only as account number is customer specific. Go to the above link,click on Book Water Tanker online option button scrolling on home page. 6. Click on Submit tanker grievance. 4. Click on Get Data Button. Go to the above link,click on Find Your CAN Number online option button scrolling on home page. 7. Click on view button. Go to the above link,click on Register Grievances online option button scrolling on home page. 9. Click on Submit Grievance button. 8. Click on View button. Information means any material in any form including records, documents, memos, e-mails, opinions, advices, press releases, circulars, orders, logbooks, contracts, reports, papers, samples, models, data material held in any electronic form and information relating to any private body which can be accessed by a public authority under any other law for the time being in force but does not include “file notings” [S.2(f)]. ** inspect works, documents, records. ** take notes, extracts or certified copies of documents or records. ** take certified samples of material. 5. Is partial disclosure allowed? The Board was constituted on 1.11.1989 under the provisions of Hyderabad Metropolitan Water Supply and Sewerage Act 1989 (Act No . 15 of 1989 ), with the following Functions & Responsibilities in the Hyderabad Metropolitan Area. The Supply of potable water including planning, design, construction, maintenance, operation & management of water supply system. Sewerage, Sewerage Disposal and sewerage treatment works including planning, design, construction, maintenance, operation & management of all sewerage and sewerage treatment works. I want to apply for water connection online.